THEMIS infrared images indicate most of the planet is producing rocks about as fast as erosion is destroying or burying them. 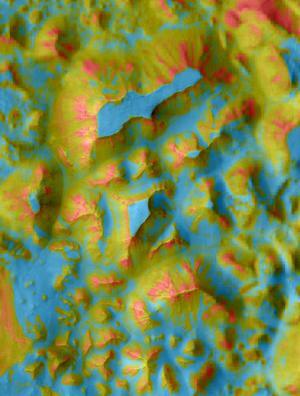 THEMIS nighttime infrared images show that the slopes of most hills and mesas, the ejecta surrounding many impact craters, and the floors of some channels have many rocks on them. Even rocks far to small to be directly imaged can be detected by THEMIS. They retain their heat at night, and THEMIS sees rock-covered surfaces as warmer than the surrounding rock-free areas. The widespread presence of rocks reveals that the martian surface remains active today. The processes that produce rocks are keeping up with those that bury or destroy them. Among the agents producing rocks today are erosion and scouring by wind, impact cratering, and possibly processes related to water and ice. The forces acting to remove rocks from the surface include burial by windblown dust or sand and erosion by sandblasting in strong winds or dust devils. Over much of Mars these processes appear to be in equilibrium today, with rocks being produced as fast as they are destroyed. Milam, K.A., K.R. Stockstill, J.E. Moersch, H.Y. McSween, Jr., L.L. Tornabene, A. Ghosh, M.B. Wyatt, and P.R.Christensen, THEMIS characterization of the MER Gusev crater landing site, J. Geophys. Res., 108, 8078, doi:1029/2003JE002023, 2003. Pelkey, S.M., and B.M. Jakosky, Geological surveys of Gale Crater and Melas Chasma, Mars: Integration of remote sensing data, Icarus, 160, 228-257, 2002.Fergason, R.L. and P.R. Christensen, Thermal inertia using THEMIS infrared data, Lunar and Planet. Sci., XXXIV, Abstract #1785, 2003. This image combines a THEMIS nighttime infrared temperature image with a THEMIS daytime visible image. The coldest temperatures (about –90° C or –130° F) are in blue; the warmest temperatures (about –70° C or –95° F) are in red. Orange tones indicate surfaces warm at night because they are covered by heat-retaining rocks. Blue areas are cold because dust covers them. Yellow and green show mixtures of dust, sand, and rocks. The cold (blue) mesas stand 1 to 2 km (0.6 to 1.2 miles) above the canyon floors. The image covers an area about 40 by 60 km (25 by 40 miles) in Aureum Chaos, at about 5° south latitude and 332° east longitude.